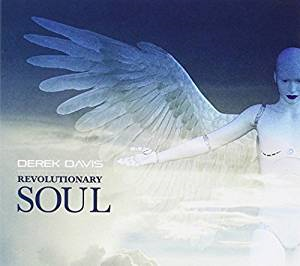 I just had the opportunity to review the newest release, Revolutionary Soul from Derek Davis. Opening with title track, Revolutionary Soul, Derek Davis drives forward with a dance beat, a rumbling bass line, tight guitar riffs and his own solid vocals. Blending acoustic guitar over a wah wah rhythm, and keys, on Rapture, Davis' vocals are well phrased and spot on. Amy Winehouse's Valerie gets a makeover with a funky bottom. Davis's vocals are cool and ever dance-able. Sticking with the light funky groove, Think About It is a high energy R&B style track with a cool bass line strong vocals. With broad wave slide work on the intro and deep rolling bass, Love And Abuse brings the tempo down a bit and with synth horns and classic guitar riffs, this track has great radio appeal. With a real funk/rock style mix, classic blues number, Nobody Knows You When You're Down and Out, is nearly unrecognizable but with obvious lyrics. Interesting. Quiet soul ballad, Vicious Heart, has a really catchy melody and could easily have strong airplay. Bobby Womack's Woman Gotta Have It is smooth and cool adding pace to the overall release. With a pop R&B feel, King of Fools floats on a dance beat with atmospheric keyboard tomes and backing vocals. Pop rocker, Picture of Love follows a radio format with a cool melody and cleverly blended backing. Another quiet ballad, Stop! Wait A Minute, is another classic radio style track with a good melody and solid vocals. Wrapping the release is funky rocker, All the Roads, like a warm blend of Ted Nugent and R&B. A more adventurous guitar solo caps off this release giving it a tighter edge.